All are welcome for a Sunday morning workshop with Yogi Nitin of Rishi Yoga. Yogi Nitin has studied with several renowned Indian yogis, most notably, Baba-Ji (Shri Shri 108 Baba Dhuni Nath). His credentials include CMT, CPT Ayurvedic Consultant,Yoga and Reiki Master . He will teach and we will discuss the important of a daily routine and especially one that include Ayurvedic and Yogic practices. Please, join us -- click here for more info and to register! Thank you for your interest in Yogi Nitin but the workshop at Sanctuary is full. Please note however, we are delighted to direct you to these other Yogi Nitin activities taking place in Kalamazoo at the Sambodh Center for Human Excellence this weekend. Shanti Paths - a peace mantra that Yogi-ji opens his class with. Suksham Vayayam - preparatory stretches that warm up the body for asana. Bhuta Shuddhi - a purification of the elements/chakras within the human system. For over 13 years Yogi Nitin Gill has been teaching Yoga, Meditation, Reiki and Ayurvedic Healing in the spiritual city of McLeod Ganj, India, nestled in the Himalayan foothills of the Dhauladhar mountain range and home of the Dalai Lama in exile. Yogi Nitin has served hundreds of travelers from all over the world who have come to visit this unique spiritual city and to learn these ancient healing practices. While living in McLeod Ganj, Yogi Nitin also performed volunteer work for Tibetan Refugees and other McLeod Ganj community members seeking his help. During his childhood, Nitin’s thirst for knowledge led him to his guru, Shri Shri 108 Baba Dhuni Nath – respectfully called Baba-ji – who remained in the Himalayas in a state of super-consciousness (samadhi) for 35 years. Yogi Nitin’s natural passion for yoga and healing grew throughout the years as he participated in numerous annual retreats, guided by his guru, Baba-ji, at his Himalayan ashram. Yogi Nitin has dedicated his life to spreading the ancient wisdom of the East - the knowledge of yoga, meditation, and natural healing - to seekers living in the West. 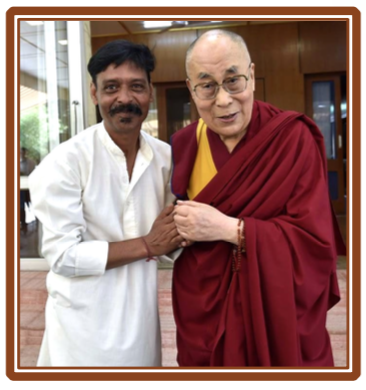 Yogi Nitin frequently returns to India where he continues to be a dedicated volunteer in his local community, McLeod Ganj, working with organizations such as Asia Health Resort and the Tibetan Delek Hospital. Yogi Nitin received an award as “Ambassador for Peace”, from the Universal Peace Federation of Jacksonville, Florida. Yogi Nitin has been touring the United States for more than nine years, working with various wellness centers in Florida, North Carolina, Michigan and Vermont. He has taught yoga in places such as the Lake Eden Arts Festival, Black Mountain, NC, and the Song of the Morning Ranch Yoga Festival in Vanderbilt, Michigan. Over the past 10 years he has continued to return to India to be involved in various trainings and retreats. In the United States, Yogi Nitin offers group yoga classes and also private Yoga Therapy sessions for individuals with specific health needs. He is knowledgeable in healing yoga therapies, such as Yoga for Asthma, Yoga for Arthritis, and other conditions as well. He has also established his own practice – Rishi Yoga Healing Centre – in Burlington, VT. The art of healthy living through yoga has been enjoyed for millennia. Yoga and ancient methods of healing help to relieve physical and mental stress from one’s inner core. Yogi Nitin has been teaching his students and seekers the ancient and authentic form of Yoga that descended from a lineage of yogis and sages, which he learned from his revered guru, Baba-ji. Yogi Nitin helps his students to become free of physical and mental distractions in order to focus on the Self with great confidence, so that, in turn, his students internalize the tradition of Yoga and share that lineage of love and peace to others.